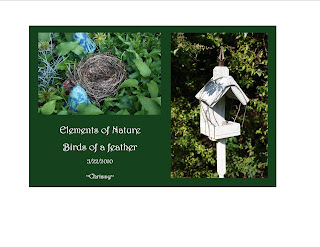 The photo of the bird nest is in my front flower bed, If I find a nest I always save it. This little one came out of our light fixture on our porch about a week ago from last spring. I have lots of bird nests in my nature collection. The bird house is my neighbors and it sits on the edge of the woods and I love the whimsical and rustic look.